Flutter.io is a mobile UI framework that enables you to craft apps for Android and iOS. If we take other frameworks into consideration, Flutter is a relatively new platform in the mobile app development industry. 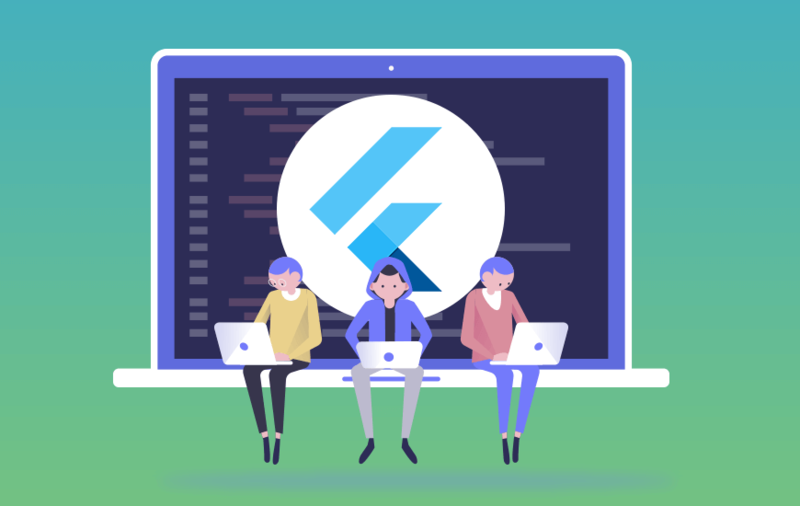 Flutter is Google’s open-source mobile application development SDK which is specially crafted for designing cross-platform native apps. After its release in May 2017, Flutter has established itself as a complete mobile app development tool, and the backing from Google indeed adds more value to it. Moving forward, today we are going to discuss the apps that are built on this remarkable platform. But before that, let’s have a look at the ups and downs of the Flutter. If Flutter has made its mark in the developer’s community in no time, there must be something that has helped it to earn that credit. Take a look at the high-points of Flutter. Community plays a significant role for developers to get their issues sorted and this factor doesn’t favor Google’s Flutter. Besides, following are some other shortcoming of this mobile app development platform which you should know. Now, as you are clear about the good and bad things of Flutter framework, let’s now focus on the apps built using this tool. Flutter is deployed by Google and many other organizations to craft beautiful native apps for iOS and Android platforms. Following are some of the apps built with flutter. 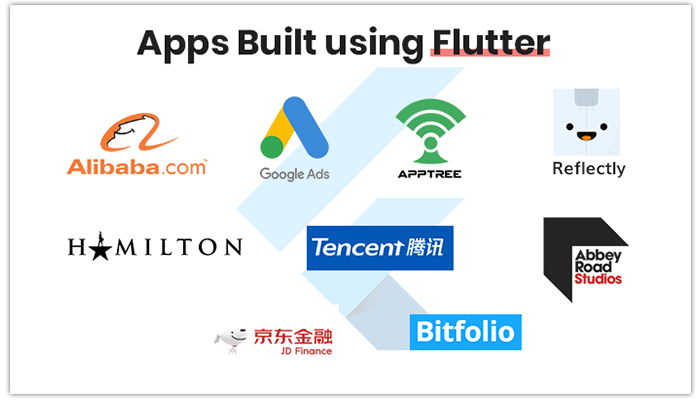 Alibaba is one of the world's biggest online commerce company and has used Flutter to develop an app experience for iOS and Android on their Xianyu app. The Flutter app has over 50 million downloads. The app is incredibly helpful for the user to source products for the business from across the globe and that too at an incredible price. The Google Ads is another app that is made using Flutter framework. This Flutter based app helps you keep your ad campaigns running smoothly; no matter where your business takes you. The app offers various features like view campaign stats, update bids and budgets, get real-time alerts and notifications, call Google expert, and much more. The third app in the list is AppTree, which offers an enterprise app platform for brands like Stanford, McDonald's, & Fermilab that let them use common business app functions such as data collection, inspections, labor entry, audits, and workflow with existing enterprise software data. Also, it tackles issues like performance, security, off-line usage, authentication and integration with existing systems. Reflectly app is also built using Flutter. It’s a beautiful journal and mindfulness app driven by artificial intelligence. With well-structured audio-reflections, the user can take help from leading experts in self-care and self-help, which can further help in reducing stress and developing gratitude. The app employs positive psychology, cognitive behavioral therapy, and mindfulness to overcome negative thoughts and prevails positivity. The official app of the hit Broadway musical, Hamilton, is a gem developed using Flutter mobile app SDK. The app includes daily lotteries, exclusive news, a trivia game, a merchandise store, and more. The app was released by Lin-Manuel Miranda to extend Hamilton experience to the users and let them enjoy the show in a more engaging way. An internal customer management app used widely by Google sales that provide rich visualizations for tracking sales targets. Google Greentea is an app that is being built by Google while using the Flutter framework components. Abbey Road’s Topline app helps artists record songs and is crafted using Flutter. You can share files, add lyrics, sing over imported tracks, and more. The app is built in close coordination with emerging songwriters and producers from across London. The aim of this app is to bridge the gap between Abbey Road magic and music makers. NOW Live is Tencent’s video streaming service. The app has tens of millions of MAU and is framed on Flutter SDK. With this app, you can come across many people and strike a conversation as per your choice. To add more fun to it, the app also offers online games, outdoor activities, celebrity videos, and much more. JD Finance is a leading digital technology company, which have used the Flutter framework to get their app done. The company covers various services like fintech, digital enterprise, and urban computing. Bitfolio is an app that helps you to maintain the cryptocurrency investment portfolio. The app is crafted to manage investments and track the cryptocoins like Bitcoin, Ethereum, and Litecoin. The app also helps the user with the latest coin prices and market charts for smart crypto investment. So, these were the Flutter apps that work flawlessly. If you are looking to build an app in limited time, that too with untold perfection, pick Flutter and get going because this mobile app SDK has some excellent set of tools that will make your app super-awesome. NEXT Everything About Google's #IMakeApps Campaign and How To Get Featured?